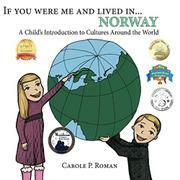 The latest installment of this children’s book series introduces kids to the culture, geography and traditions of Norway. Roman’s latest book follows the same formula as the first three books in her series, A Child’s Introduction to Cultures Around the World, which previously took kids to Mexico, France and South Korea. Written in the second person, Roman’s book invites young readers to come along with her on a tour of the country and to imagine experiencing a different life. This time, she turns her attention to Norway and the Scandinavian country’s cuisine, sports and language. She begins with a map of the country, noting its location on the globe as well as the nation’s capital, before describing landforms and geography. Once she’s situated kids in the country, it’s time to learn about local traditions and customs. While on vacation, “You would also go snowmobiling, ice fishing, and on dogsled trips.” The activities should help work up an appetite for “an open faced sandwich with either shrimp or chicken called a smørbrød. A vafler topped with krem, which is a waffle with cream on it, would be the perfect way to finish your meal.” Roman also mentions that the country’s major holiday, Syttende Mai, celebrates Norwegian independence on May 17 and includes a parade. The story also makes kids stop and think—“When the shopkeeper says ‘Thank You,’ you would respond, ‘Din velkommen.’ Can you guess what that means?”—and at the end of the book, a pronunciation guide will help kids learn how to say Norwegian words. Like the first three books in the series, this text provides a great overview of a likely unfamiliar culture for kids. The colorful illustrations, such as a picture of the Syttende Mai parade, a smorgasbord with different traditional dishes and a dogsled led by huskies, can help kids better envision what they’re reading. This title, as well as other books in the series, would be worthwhile for teachers to keep in the classrooms or for parents to help introduce their children to cultures of the world. The simple, engaging premise works again.